The Pyle PD3000A Home Theater Preamplifier Receiver provides versatile audio and video entertainment. The system comes loaded with features like a front-loading CD/DVD player, AM/FM radio, USB flash drive reader, aux (3.5mm) input and two 1/4'' microphone inputs. The high-powered 3000 watt system will deliver power and performance to your living room's entertainment center -- all while having compatibility with today's latest devices. Connect to your entire home theater system including your TV, DVD player, soundbar, external speakers and more. Connector types include four pairs of speaker terminal binding posts, two pair of RCA audio inputs, subwoofer output, digital optical audio output, along with S-Video, RCA and YPbPr component video outputs. MP3 audio file support will allow you to play your entire digital media file library and you can even connect your computer or laptop for instant audio streaming. 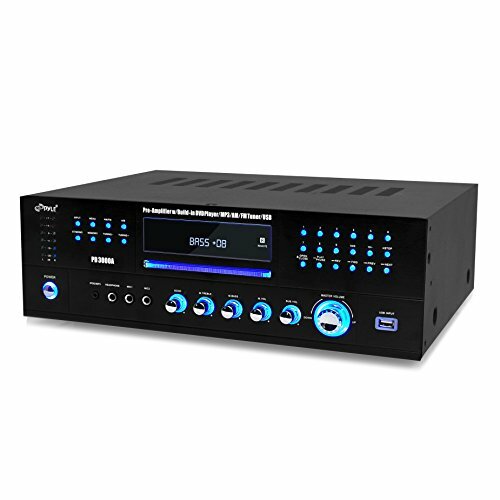 Enjoy versatile multimedia entertainment ability with the Pyle PD3000A Home Theater Preamplifier Receiver Audio & Video System.